One of the sites of the Vans Triple Crown of Surfing. Surfing is more than just a hobby in Hawaii. To some, it’s a way of life. From the gentle breaks at Waikiki to the big waves of Sunset Beach, Oahu is the place for surf fans. The North Shore’s legendary surf spots offer some of the most challenging sets in the world. As a result, they make Oahu a popular setting place to witness the skills of the world’s best surfers. Hawaii hosts several world renowned surf competitions. Foremost of them is the Vans Triple Crown of Surfing. 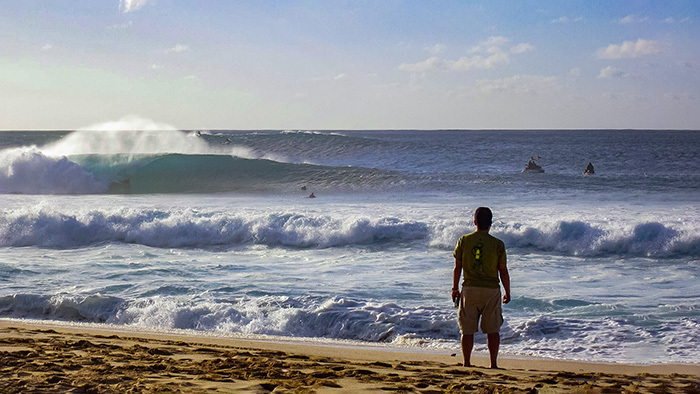 The Vans Triple Crown is a series of four surfing events held on the North Shore. They include HIC Pro, the Vans Hawaiian Pro, the Vans World Cup of Surfing and the Billabong Pipe Masters. Location and timing of the events may vary depending upon conditions. This surf competition is one of the most difficult events of its kind. Here, participants have to prove themselves by mastering waves of up to 50 feet in different locations. While there is a single winner for each individual event, there is an overall champion for all of them. Experts consider the championship winners here to be the most skilled surfers in the world. Guests and visitors vacationing in Hawaii for the holiday season should attend this famous competition. Admission is free and those interested can stake out their spots on North Shore beaches. Hawaii’s first international surfing event occurred in 1954 on the western shore of Oahu at Makaha. This contest became so popular that many considered it a world championship event. It ran every November through December until 1971. During the 1960’s, ABC broadcasted coverage of the surf competitions. But they eventually moved to the North Shore where waves were thicker, faster and more treacherous. Pro surfer Fred Hemmings established the first “Pipe Master” in 1971. He called the event “Hawaiian Masters” and offered a modest $1,000 prize to the winner. By 1983, the surfers were battling for the championship on the North Shore. This was the first official Triple Crown Surf competition and had three separate events. Now 33 years and counting, the Vans Triple Crown is the most famous surf competition worldwide. Once you see surfers charge down these fearsome waves, your view of surfing in Hawaii will forever change. Witnessing the Vans Triple Crown of Surfing is an unforgettable experience even for those who never surfed.